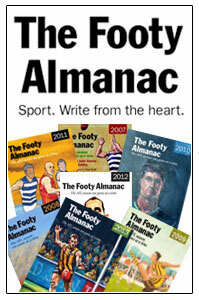 As the river source is the original point from which the river flows, then Country Football is Australia’s Footy Source. Rupanyup, (an Aboriginal word meaning ‘branch hanging over water’) is a small town in the Wimmera with a population of aprox 540. Like most country towns, sport was a social necessity. It still is, but the dwindling populations have forced most local towns to merge with their closest rivals in order to field a team. Rupanyup has supplied its share of footballers into the VFL; Bob Dunlop played with Essendon, winning best first year player award in 1960, returning to Rup, in 1962. John Sudholz played for South Melbourne in 1966, topping the club’s goal kicking for four consecutive seasons and in 1970 topped the club with 60, Hudson, McKenna and Jesaulenko kicked tons that year. Greg Bell was another Rupanyup player recruited to Essendon in 1975, winning Essendon’s best first year player until an injury cruelled his season and VFL career. Trevor Tyler also was recruited by Essendon, 1973-1976. A recruit that got away was Ian Morgan, targeted by Bob Davis for Geelong and after a couple weeks with Doug Wade, gave the game away and returned to the farm. Some say the reason for returning was preference for the farm life and others that he was persuaded by his dad wanting a fit son to be able to help with the farm. 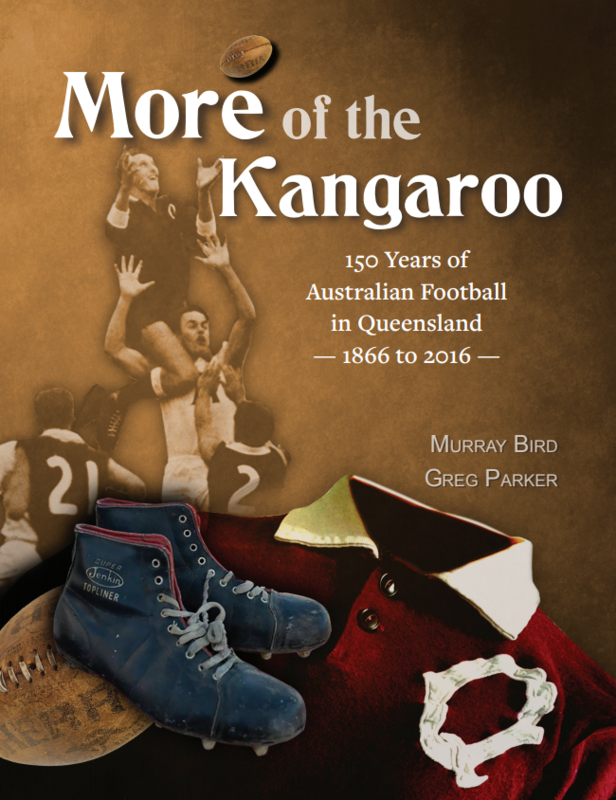 Morgan and his three sons went on to play close to 1,000 games for Rupanyup. 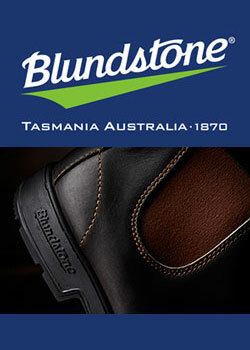 My partner’s family live in Rupanyup, a Teasdale has lived and worked in the area for over 100 years. My father-in-law John Teasdale was not a footballer. If he was I could imagine him a nimble rover like Barry Cable. John’s passion was film. Over his life time he recorded historical events, the social and cultural fabric of country towns. A great deal of his time was filming Rupanyup Football. A Melbourne film maker Malcolm McKinnon restored John’s films and adapted them into social documentaries of the time. A good example and well worth watching is Drop Kick Eulogy, a couple of Rupanyup stalwarts recounting the days when the drop kick was king, before the invention of the more reliable but less skillful ‘drop punt’. 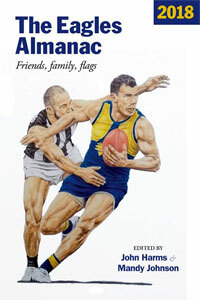 Recently I was fortunate to read “The Footballer, the Official Organ for the Wimmera Football League”. The Rupanyup Historical Society has been posting these gems on their facebook page. Not only is it a great insight as to what was happening in the day, which businesses were advertising, who the players were but also the language, something we seem to be losing. I have typed out the match report from the 1954 issue, Rupanyup Rumours. Enjoy! Courtesy Marie and Scolly Dunlop supplied Rupanyup Historical Society. Congratulations boys, a fine fighting finish and another well earned four points. Did you hear one of the selectors yelling out to only kick a point when time was nearly up and scores level? We got the point alright but not in the manner it was supposed to have been accomplished. I reckon Sandy’s back is still sore from the heavy patting it received after the match. Thirty seconds to spare is a little bit too close to be comfortable. Anyone hear that Rup had 19 men playing in the second half? Yes the 19th was Harold, playing a mighty strenuous game from outside the fence. Harold hopes to be right back in the centre for today. Bluey had to retire at half time but should also be O.K. Jimmy Dunlop and a Nhill player seemed to be playing kick to kick for a while in the second quarter. Nhill were unlucky in this quarter kicking 10 points before a goal could be registered. The fine marking by members of both teams was a treat to watch, but I would say on the day Nhill held the honors. Our forward work needs polishing up a bit. Too many high floating passes to the forwards allowed Nhill backs to intercept and clear. What about it chaps? Fast, snappy passes into the right place is what is needed. Brian’s effort of six goals was an excellent performance and one of his goals was a real beaut-almost half the length of the ground. The trophies of the day were donated by Mr. W Chidlow and were won by Ray Watson and “Bar,” who was perhaps the best man on the ground. Nhill’s coach Jack Thompson said “Bar” would get his vote anyway. Others to do well were J. Gull, A. O’Bryan (until injured), Bobbie Isbel, Jim Dunlop, Ray Isbel and Eddie Schaper. Eddie is probably the luckiest man in Rupanyup. On the Thursday previous to the match he lost the contact lens of his eye during training. Half the team searched for it without success. Two teams ran all over the oval on Saturday and on the Sunday morning a few chaps went out for another look and Eddie’s brother, Henry picked it up. The lens is only about three eighths inch diameter, but cost around the £25 mark. Please to know you have it back Ed. All players received a bonus of 10/- for their win. We must congratulate the Nhill boys on their fine display. It must have been a trifle disappointing to have victory snatched away in the last few minutes. It happened to us the week before. I would say Nhill was best served by Coach Jack Thompson (who played a sterling game all day), Wes Warwick, Max Chilton, C. Reichelt, E Rowarth (in the ruck), and Ron Beer (in the second half). Ron was returning from holidays and his train was late and so was Ron. He came tearing in the gate well after the match had started. He went on after the long interval. Up at Nhill the seconds completed the double by defeating Nhill by 10 points. Congratulations, Bub and Co. The match at Nhill was also interesting in the final stages. Rup. Had a five goal lead at the final change, but Nhill whittled it down to three points with only about three minutes to go. Trophies donated by Mr. William Dunlop were won by “Bub” Grainger and Bert Hunter. Others to do well were A. Gull, R. Kelly, R. Dunlop, C. Miller, and in the second half A. Matthews. Allan couldn’t get going earlier in the game but played a champion game after the long interval. Charlie Miller who was a last minute inclusion in the team, went well and got four nice goals. Nice work Chas.! The basketball* girls gave Rup. A triple win by defeating Nhill 27 goals to 18. A good effort, girls. Well, today it is Jeparit on their own ground and it is never an easy task to toss these boys on their own ground. However the team should be at top strength for to-day’s match. A newcomer to be welcomed to the ranks is Glen Foster, a utility player from Mirboo North. You are teaming up with a great lot of chaps Glen, and we wish you all the best. For those who cannot travel to Jeparit don’t forget the seconds who will be playing at home. 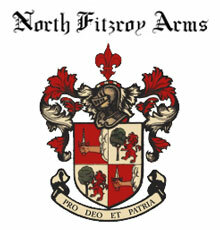 They will welcome your support. 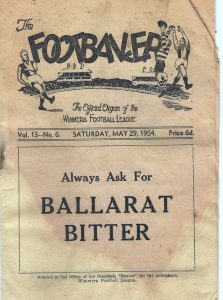 The Footballer Vol 13 no 6 May 29 1954, courtesy Marie and Scolly Dunlop with thanks to Rupanyup Historical Society. A keen observer of all things sport and a Swans tragic, David likes to dabble in sporting documentaries including the Max Bailey doco for Fox Footy. David is currently filming a documentary on the Australian Cycling Men's Team Pursuit squad as they prepare for the 2016 Rio Olympics. Austin Robertson Jnr told me that when Allan Miller was appointed South coach for 1967 he told Ocker he was going to play John Sudholz at full-forward so after kicking 60 goals in 1966 he went back to Subiaco… where he kicked 100s. Shame Norm Smith didn’t have Ocker to team with Sudholz in the first semi final in 1970…. Sudholz given his size and stature was like a Bob Johnson. He kicked 60 goals that season. Top effort. I well remember the distinctive name Sudholz. John’s old man was a Labor Senate candidate for Victoria in the 1960s. It’s astonishing these days to think that tiny towns like Rup, Jeparit, Dimboola Minyip and Murtoa were able to be competitive in the Wimera League with places like Horsham and Ararat. Nice piece Dave. Love these old footy docs. Peter, Minyip Murtoa have been flying this season – Clinton Young has gone home and there is plenty of talent in the team generally. A stack of Delahunty boys. They’re top of the table having smashed Ararat yesterday. Dr Rocket and I are hoping to get up there at some stage this season.May make a road trip out of it if you are keen. I began my working life as a teacher at Dimboola. My principal was more interested in what l could offer the football and cricket clubs than the high school! I have great memories of playing at the Wimmera grounds. Rup were playing in the Horsham and District league by that stage, but Murtoa, Minyip and Jeparit we’re entities in their own right in the Wimmers league. Each town had their own local families who provided the stars of the team. The Morgan’s at Rup were mighty but so were the Bush boys at Dim and the Funckes at Minyip. And once the footy season was finished, you lined up against the same names at cricket. And those casserole teas at the end of each home game….great times, great memories. Thanks Dr Rocket, would have loved to see both Jumbo and Ocker competing for bags of goals at South. Seems though even today we have an issue with two strong forwards. Peter the struggles today to maintain a 1st side let alone a ressie side are getting harder but Rup and some of the others up that way can hold their own. I understand there were discussions this year that Rup may even have to pay for outsiders, the way of Country footy unfortunately. Thanks Ross for your memories, I remember watching a game at Natimuk, cold windy and poor visibility through the car’s windscreen but the afters were always warming. According to my mate, Haydn Caris, whose Dad coached Murtoa after playing at South in the 50s, Rup were Murtoa’s local derby. Apparently Jumbo had a profound influence on the 1973 grand final when Rup beat Murtoa…. I heard that after his career with Swans, Jumbo was offered money to coach Murtoa until Rup jumped in and matched the offer. Couldn’t have a Rup legend coaching against them. Strangely I think hit was also king hit in the GF against Murtoa, his last game.